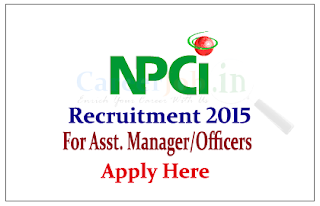 National Payments Corporation of India is recruiting for the post of Assistant Manager and Officers. Interested and Eligible candidate can apply online on or before 27th July 2015. Company Profile: The NPCI symbol uses the acronym of the organization’s name. The letter forms are arranged to reflect solidity with progressiveness and dynamism. The use of the red dot and swirl make the entire image unique and memorable. The swirl also communicates worldwide presence. How to Apply: Interested and eligible candidate can apply online on or before 27.07.2015. For more details kindly check official notification.